Couples, families, and groups who want a secluded & eco-conscious stay by the beach. Kasiiya is an eco-luxury boutique hotel that merges perfectly with its surroundings. Hidden from the world by woodland and beaches, Kasiiya encourages wellness, privacy, and adventure while enjoying modern luxuries. Each suite is a tent all of its own, steps away from the nature of Guanacaste, in the Northwest coast. Take in the breathtaking scenery, commune with the sounds of nature, and experience the raw beauty of the area while still being pampered. Boutique feel. The hotel has only five rooms available and a detail-oriented staff. Eco-luxury experience. Eco-sustainable practices and modern amenities are combined with a deep love for nature. Seclusion. Although easily accessible by roads, the property is isolated from others to help you unwind and commune with the surroundings. All-inclusive resort. This is a boutique hotel that provides a daily meal plan. Crowds. The area is quite secluded and away from the larger crowds of other areas. City life. Kasiiya is a place to forget about the world and retreat into nature. Kasiiya is a Swahili phrase, meaning “find your pace.” This secluded 123-acre property is designed to help you slow down and enjoy life at your own pace in an intimate ambiance. With an emphasis on nature and wellness, this hotel has plenty to offer for those who want to relax and recharge, as well as for those who want to head out and explore the area in search of adventure. Strategically located away from prying eyes, Kasiiya is a 45-minute drive away from the Liberia International Airport. It’s completely dedicated to the surrounding environment, with ecological practices built into its very essence. Sleeping in a remote forest was never so effortless! Tented suites await for you at Kasiiya. These are fully appointed with modern amenities, but inspire connection with nature through their decks and terraces. They are all designed to provide privacy and comfort. Attention to detail is one of the trademarks here – from the decorations to the staff, care and service are top-of-the-line. To help you unwind and disconnect, there are no electronics like TVs on the suite. However, there are books, incense, bath salts, and in-room spa services to relax and reconnect with yourself. Wake up to the songs of birds and watch the sunrise, or sit back on your chair with a cocktail to enjoy the sunset from the deck. Built on timber platforms, Kasiiya makes an effort to merge with the surroundings without damaging it. This concern is felt throughout the whole property and the different facilities available for your enjoyment. For extra relaxation, the spa is available in the middle of the jungle. Enjoy treatments with local volcanic stones, oils, and mud to rejuvenate the skin and soothe sore muscles. In case you need it, there’s also an on-site healer that can help guests pause and practice mindfulness through different techniques and rituals. Their dedication to nature is also visible in the way Kasiiya manages itself. Natural materials are used for consumption and construction, even using solar panels and harvested rainwater. Kasiiya is not just a place to sit and relax, it’s also a great homebase if you want to go out and explore. Both the dry rainforest and two beaches are within easy reach, so keep your eyes open for spectacular wildlife. Monkeys, birds, lizards, and marine creatures coexist around the property both among the trees and the in the ocean. If you want to stay active during your Costa Rica glamping vacation, then hit the road to train outside. A gym and personal coach await in the middle of the jungle, and there are different paths to go hiking and tree climbing. Practice yoga in one of the fitness platforms while enjoying the expansive ocean views around it. Or take some of the available gear or book a tour at the hotel and visit one of the two beaches in the property for kayaking, snorkeling or stand-up paddling. Some of the suites are even located directly in front of one of the best snorkeling spots in the area. Depending on the season, there’s even the chance to go whale-watching or on a special night excursion to see turtles hatching. The two on-site restaurants are also a destination all of their own. Both the Beach Cabana and the Sunset Lounge are available for top-notch meals, cocktails, and smoothies. They put creative spins on the local and international options, with organic products sourced locally whenever possible. 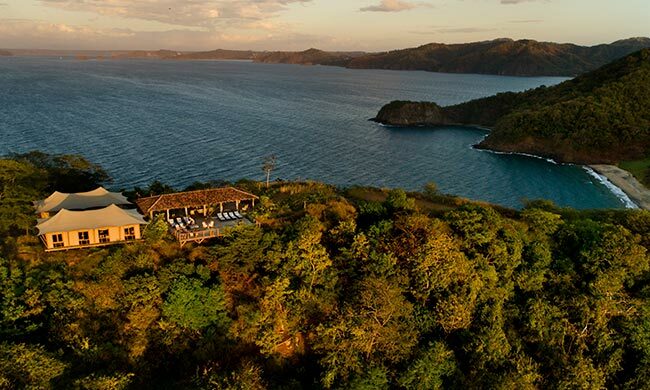 Don’t miss eating dinner at the top of the hill to enjoy the sunset with a 360-degree view of the Gulf of Papagayo and the Pacific Ocean. If getting away from crowds and reconnecting with nature sound like the perfect Costa Rica vacation, then this is the destination for you. Contact us and we’ll gladly help you experience the glamour of a Costa Rica glamping retreat.